Why do so many expats choose Panama? Often the intangibles…the feel of a place…play a big role. But there are also a lot of concrete, quantifiable reasons Panama is so appealing, starting with its modern infrastructure. Panama’s cosmopolitan capital, Panama City, is the only true First World city in Central America. The beautifully maintained Pan-American Highway runs the breadth of the country, making travel easy. High-speed Internet and cell coverage are remarkable…as are the power, air, and water quality. For expats from the U.S., Panama is also convenient because the currency is the U.S. dollar. No matter where you’re from, you’re likely to appreciate the fact that there are many English speakers in Panama, especially among the well-trained medical community. The hub that is Tocumen International Airport makes it easy to fly from Panama to nearly anywhere in the world…often with no layovers. Many of the expats here also cite Panama’s geographical diversity and location, with proximity to North America being a major factor. In a country roughly the size of South Carolina, you’ll find mountains and beaches within an easy striking distance—no matter where in the country you are. Wake up on the Caribbean and have lunch overlooking the Pacific…they’re a couple of hours apart at the isthmus’ “skinniest” sections. Choose your preferred climate, topography, population density and more in Panama’s varied landscape. And then there are factors the lists and indexes can’t quantify. For instance, the people of Panama are beautiful, inside and out. Get to know them just a little and you’ll see they have big hearts and an even bigger zest for life. They’re welcoming to foreigners, who in turn feel safe here. Increasing numbers of North Americans, Europeans, and others are moving here and contributing to the burgeoning economy. Some expats come in search of adventure or a quality retirement destination, while others seek to take advantage of all Panama has to offer as a business destination. There are well-established expat populations (and many clubs and organizations) in Panama from all over the world. There’s a palpable excitement as the country is coming into its own. You can see it in the exciting food and culture scenes and the flashy, innovative architecture and the new industries that are adding to local offerings. New laws to encourage filmmaking paved the way for Panama to get its very own International Film Festival. The annual jazz festival is a renowned event. Major international summits are held at Panama’s large, modern convention centers. You’ll find golf, tennis, sailing, fishing, surfing, birding and every other activity imaginable—with the exception, of course, of snow-skiing. With so much going on, expats here will tell you that it is easy to make friends, regardless of age, gender, or marital status. For those looking to move to Panama or live here part-time, two new residence options make moving here even easier than it was before. (Quite a feat, as the Pensionado residence program has already helped thousands move here with relative ease.) These days, there’s a visa for everyone. The international community here has always been strong, but thanks to the new residence programs, it’s growing faster than ever. And new arrivals are introducing locals to new foods, activities, methods and more. It’s been great for Panama. These days, you can get trendy food items like kale and chia seeds…indulge in clothes from Banana Republic and Gap…and buy specialty items, from kitchen and barbecue gadgets to sports and hobbyist gear. Then there’s the cost of living. Panama is not the cheapest country in the region, but it is often cited as the best overall value for your money. If you daydream about sunshine, tropical beaches, and welcoming locals, then Panama may be for you. A couple can live well here for $2,500 a month or less, including rent. Panama is the southernmost country in Central America and is bordered by Costa Rica and Colombia. Located only 622 miles from the equator, Panama has almost 12 hours of sunlight and darkness with a slight variation of only half an hour between months throughout the year. 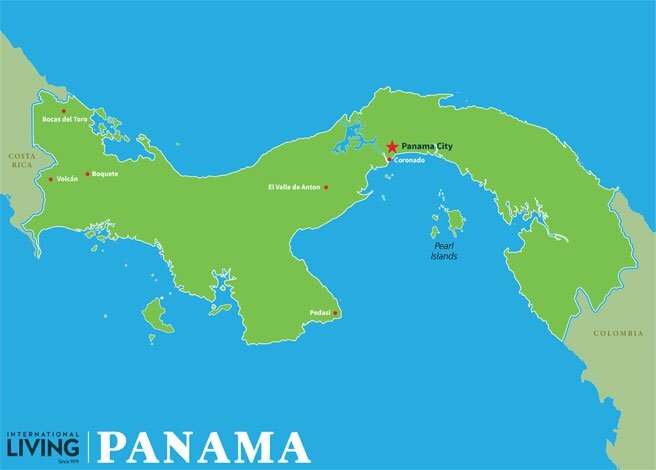 The narrowest of all the Central American countries, Panama is 37 miles wide at its narrowest point and 110 miles at its widest. From the top of Volcán Baru located in the province of Chiriquí, on a clear day you can see both the Pacific and Caribbean oceans standing in the same spot. What is Panama Known For? While many people have heard of Panama, they don’t know the significance of its location and its dedication to progress and diversity. The narrowest section of Panama is what prompted the building of the Panama Canal back in 1881. The canal itself is 48 miles long from the Pacific Ocean to the Caribbean, saving ships days of having to go down and around the tip of South America. The longest highway in the world, the Pan-American Highway is 19,000 miles stretching from Alaska to Panama. The highway is interrupted in Panama in the province of the Darien Gap by 100 miles of swampland and thick forested jungles which is home to indigenous tribes. The highway continues on the Colombia side for another 11,000 miles ending in Ushuaia, Argentina. Although Panama is south of Costa Rica, Panama itself runs east and west, the opposite of other Central American countries. Confusing at times, the Pacific Ocean in Panama is to the south of the country and the Caribbean ocean is north. Panama is an important country for many reasons. Considered an isthmus (a narrow strip of land with sea on either side, forming a link between two larger areas of land), it became a land bridge approximately 2.8 million years ago connecting both the North America and South America continents. Over time this formation affected the biodiversity of the world enabling animals to migrate from north to south, changing the weather patterns across the world, even in Europe. The development of the isthmus created the Gulf Stream which gives definition to rainfall amounts, temperatures, tides, and climates for the region. What’s the Climate Like in Panama? Panama has the perfect climate because it stretches from east to west getting the benefits of the trade winds coming onshore. Outside the hurricane belt further north, Panama enjoys stress-free living. Rainy season and dry season come and go without incidence. In terms of weather, predictability is Panama’s middle name. The dry season starts off the new year in January and lasts until mid-May. During this time rain is mostly nonexistent. Days are usually cloudless, with hot breezes, and warmer temperatures. Average day time temperatures range from 90 F to 95 F with night temperatures dipping to 75 F. Mountain areas are typically about 15 to 20 degrees cooler. The rainy season usually starts off in mid-May. At that point sporadic rain showers begin during the afternoon and evening hours. As the days pass the rain increases in duration, amounts, and evenings are full of wonderful thunderstorms and beautiful lightening. In the mountain areas flash flooding can suddenly occur during these months. During the rainy season day time temperatures are about 10 to 15 degrees cooler than the dry season but the humidity is much higher. The rainiest month is November but by mid-December the rain is completely gone in most of Panama on the Pacific side. In 1501 Rodrigo de Bastidas of Spain landed on the Caribbean side, discovering the Americas. Just a short 18 years later, 1500 Spanish settlers had established the oldest European settlement on the Pacific Coast of the Americas in what was called Panama Viejo, near the current Panama City. Finding that the two oceans were not far apart, conquistadors began transporting goods from the Caribbean side to the Pacific side in what became known as the El Camino Real or Royal Trail. This enabled two-way traffic of carts carrying treasures to go from sea to sea. In 1671 the famous pirate Henry Morgan burned down the original Panama City. For over 300 years, the Spanish ruled Panama. Struggles to gain control of many of the Central American countries continued for decades. In 1821, Panama gained independence from Spain only to join what was then Colombia later that same year. In 1846, a treaty between Colombia and the United States was signed, permitting the U.S. to construct a railway across the country. By 1900 Panama wanted to declare itself independent from Colombia and in 1903, Panama declared independence and the U.S. recognized the sovereignty of the new country. Colombia finally relinquished in 1921 and declared Panama a separate nation. As U.S. presence increased with the building of the canal, taken on from the French, but the U.S. influence and intervention was not welcomed in all circles of Panama. As Panama came into its own, full control of the Panama Canal was given to Panama on the last day of the year in 1999. This was followed by a complete withdrawal of U.S. troops from Panama. Flights from around the world now fly into Panama. Tocumen International Airport now has arrivals from Toronto, Frankfurt, Paris, China, South America, Cuba, Mexico City, and many U.S. destinations. Panama is a four-hour flight from Houston, eleven-and-a-half-hour flight from Paris, and a five-hour flight from Toronto making Panama easily accessible. Copa, Panama’s own airline flies to many of Caribbean destinations as well as flights to the United States. As Panama becomes more and more popular with travelers, Tocumen is adding new terminals and gates to allow airlines to establish new routes into the country. What is Panama’s Economy Like? Panama’s economy continues to grow, outdoing its neighboring countries. Between 2004 and 2013 the average GDP was 8.4%. The forecast is a promising one for Panama in 2018, with a prediction of the economy growing 5.5% and the GDP expects to expand 5.4% in 2019. The yearly income revenue from the Panama Canal just topped $1,650 million in 2017. With money in the government coffers, infrastructure projects sponsored by the government continue to be implemented, making Panama one of the leading countries in Central America in terms of infrastructure with good roads, bridges, parks, and sporting venues. The stability of the government, location for shipping, world banking, and a prosperous outlook makes Panama one of the best places to live and do business. Not surprisingly, interest from foreign investments continues to grow every year and the population reflects this diversity. What’s the Infrastructure Like in Panama? The infrastructure in Panama is good. Panama has reliable services for the most part for electricity, internet, and water. The water is potable throughout most of the country, 60% of electricity is driven by hydropower in the Panama Canal and internet speeds can go as high as 1GB. Where do Most Expats Live in Panama? North Americans live throughout the country but there are some cities and towns that draw a larger expat population. With a population of over 1.5 million, Panama City’s expat population is distributed throughout the city. In Panama City you will find a mix of working and retired expats. There are several groups of expats that meet on a regular basis. El Valle is a small community about a two-hour drive from Panama City located in an extinct volcano crater. This quiet enclave has a small expat community among the just over 7,000 inhabitants. This unique location is close to the ocean beaches and yet has a small-town appeal. Coronado is a vibrant community located just one hour from Panama City, and many Panamanians have second homes here on the beach. Of the 5,000 plus population there is a large group of expats which are a mix of Canadians, Americans, and Europeans. Built in 1941, this beach community is trendy with shops, restaurants, activities, and resorts. On weekends it is a favorite getaway spot for Panama City residents to spend time at the beach. 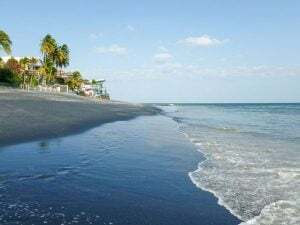 Located at the tip of the Azuero Peninsula, Pedasi is a quaint unassuming beach town with a pristine downtown area. The expat community numbers several hundred within the total population of just under 5,000. This expat community is growing as visitors have discovered this treasured jewel. Not much further down the two-lane road is Playa Venao, one of Panama’s best surfing beaches. Boquete is one of the original areas in Panama to have an expat community. Held as one of the largest expat populations in Panama, current estimates are the population of expats number 5,000 among the 25,000 people living in this highland mountain town. Boquete has always been a tourist destination for those seeking outdoor activities and cooler weather. Several expats have opened businesses in Boquete such as bakeries, hotels, and restaurants. Boquete has become known as a holistic and wellness center with an array of classes in Yoga, meditation, Tai Chi, and Chi Gong on offer. What’s There to Do in Panama? The question should be, what isn’t there to do in Panama. Depending on what your interests are you can find lots to keep yourself busy and most likely you won’t have to give up your favorite pastime. If you are an outdoor enthusiast, Panama is a perfect fit. Hiking, birdwatching, kayaking, river rafting, horseback riding, biking, golf, tennis, zip lining, and pickleball are just a few activities on offer in Panama. And there is plenty for ocean lovers, too, they can swim, snorkel, scuba dive, deep sea fish, surf, or enjoy lazy afternoons on tropical white-sand beach islands. If you are a boater, you have lots of options. Bocas del Toro on the Caribbean has a few marinas and is popular with boaters along with marinas in Panama City and Boca Chica on the Pacific side. For creative people there is an abundance of craft stores where you can get supplies for painting, drawing, sewing, and knitting. Gardeners will also love the variety of plants and flowers that can be grown here along with delicious fruits and vegetables. Animal lovers will find the abundance of wildlife beyond amazing, making Panama a photographer’s dream. There are several factors to consider when answering this question. It depends on where you are living in Panama. Small towns in rural areas will be far cheaper than if you choose to live in Panama City. Another big factor is what your personal lifestyle is. If you prefer to eat local food, participate in free activities, and live like the locals then a couple can live well on less than $2,000 a month. One of the reasons that people move to Panama is the availability to live on smaller budgets in many locations throughout the country. Panama has always been a top choice for retirees due to its tropical climate and many English-speaking locals. If you are considering retiring overseas, Panama should be high on your radar.Panama has a low cost of living and great retiree benefits. Here are our top five places to live in Panama. Read More : Should we retire in Costa Rica or Panama? In 2018 Panama is expected to outperform all other Central American countries as well as many in South America. And in its western province of Chiriquí the economy is set to boom, thanks to a $1 million investment by Del Monte into Puerto Armuelles, to start up exportation of bananas once again. Women’s Equality: Top Retirement Havens that Rank Ahead of the U.S. But what’s it like for women over there? That’s a question we often get from women thinking of a retirement abroad. It’s an important question…and one we take seriously. In fact, most are surprised to learn that the majority of countries we talk about rank highly for gender equality and inclusivity. Read More : Women’s Equality: Top Retirement Havens that Rank Ahead of the U.S.
Where could a single woman retire on $1300 a month? Read More : Where could a single woman retire on $1300 a month? Once more my husband, Gary, and I exchange triumphant looks and high fives. We have just gone online and, besides reading indignant emails from those back home in Canada, we have viewed the weather conditions in both Canada and the U.S. I moved to David, Panama five years ago and, over that time, I’ve gotten to know it quite well. I’m learning more every day, but I’ve already discovered so many wonderfully unusual aspects to my adopted homeland.